At this year's Chillventa in Nuremberg, MTA Germany is showing the proven AQUARIUS Plus series with the refrigerant R513A. 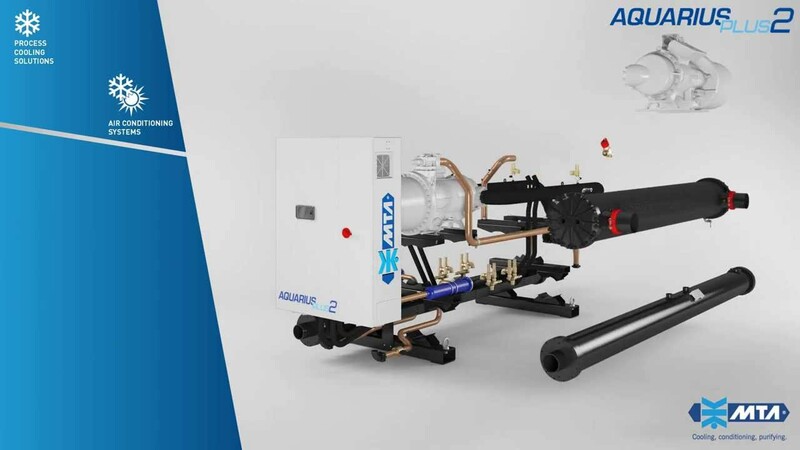 AQUARIUS Plus are water cooled chillers with semi-hermetic screw compressors and nominal cooling capacities from 377 to 1931 kW, which are also available as heat pumps and compressor-evaporator units. As an alternative, R513A replaces the refrigerant R134a, which in medium term is also affected by the phase-down of HFC refrigerants as part of the F-Gas Regulation (EU Regulation No. 517/2014). With the introduction of the low-GWP refrigerant R513A, the water-cooled chillers of the AQUARIUS series are the future-proof solution for large process refrigeration and air conditioning applications. Continuous power control, electronic expansion valves and highly efficient heat exchangers with integrated heat recovery help to achieve optimal seasonal efficiencies - both at full load and at partial load. By default, all AQUARIUS chillers are equipped with shell-and-tube evaporators, crankcase heaters and electronic expansion valves. Operational safety is maximized with phase monitoring, automatic circuit breakers for the compressors, and check and shut-off valves in the pressure lines. The chillers are controlled via the user-friendly interface of the xDrive microprocessor controller, which can be connected via the Modbus protocol RS485, via Ethernet interface or the xConnect specially developed by MTA for remote monitoring and parameterization. MTA has been producing and selling energy-efficient cooling systems for process cooling, air conditioning and the treatment of compressed air & industrial gases for more than 35 years now. In the three production sites Tribano, Conselve and Bagnoli in the north of Italy, more than 22,000 chillers, free coolers and compressed air dryers are manufactured each year. The first product manufactured by MTA, a patented refrigeration dryer, set new standards in terms of energy savings. Since then, MTA has consistently pursued this path and as a result is delivering a product range that is future-proof to meet all environmental requirements through continuous optimization of energy consumption. All products use refrigerants with low GWP (Global Warming Potential), are Eurovent certified and comply with the European Union's Ecodesign Requirements (ERP). With the development of refrigeration systems using the HFO refrigerant R1234ze, future standards will be met. Headquartered in Nettetal on the Lower Rhine side, MTA Germany serves its customers nationwide with a 50-person sales and service team. The internal engineering department develops tailor-made cooling systems for industrial and commercial applications.